The following section is step number 2 in your a process deployment, as described in From Studio to the cloud. Coordinate the deployment with all members of your project, so they are all aware of, and agree about which exact processes (and their versions) are to be deployed. 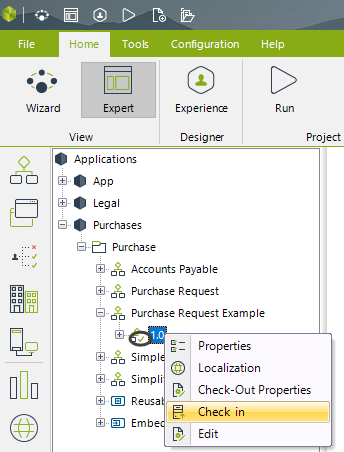 Make sure that the correct versions of these processes are all "checked in" within the Development environment. Note that a process under with checked-in status is not being edited, and that its implementation is completed. The best practice is for the team member who checked out and edited the process most recently is the person to check the process in. 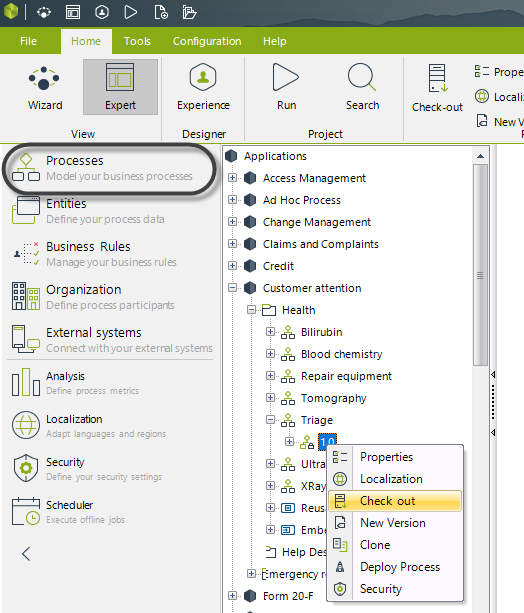 To verify that a process is checked in, go to the Expert View and into the Processes module. For more information about the check in and check out options, properties and configuration, refer to http://help.bizagi.com/bpm-suite/en/index.html?processes_in_modules_view.htm. 2. Initial deployment parameters and records. 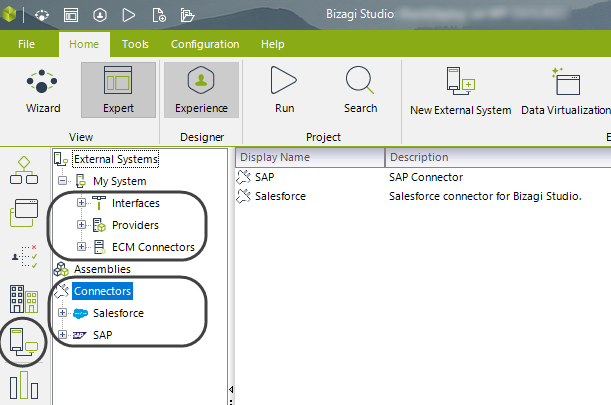 Therefore, before your first deployment, review the settings as configured throughout the different Bizagi Studio features. Set these so your first deployment automatically set the values of your target environment. However, after the first deployment or at any time while that the target environment is live, you may modify the values through the Management console. 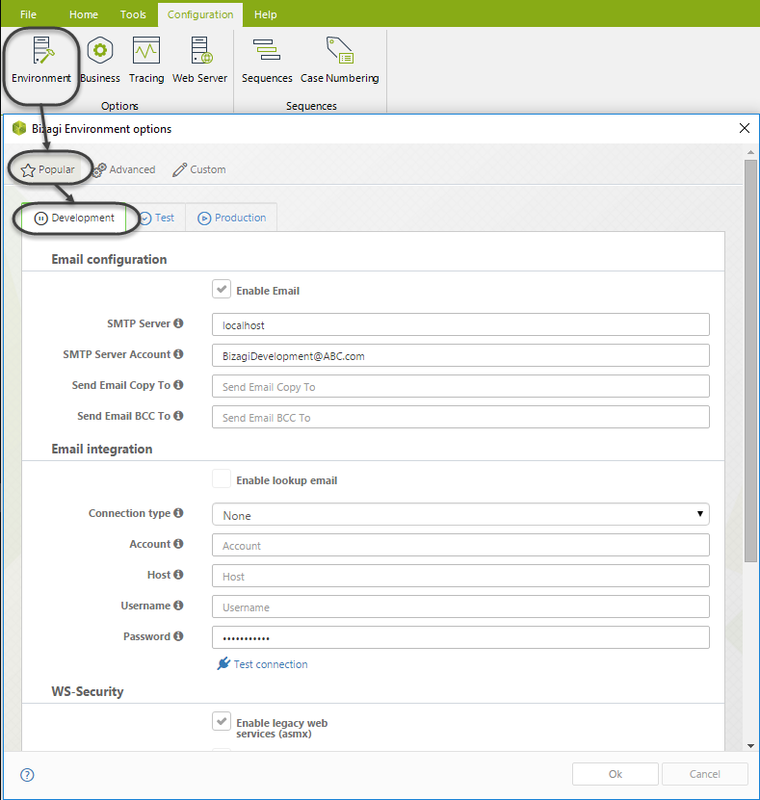 To learn about more how to modify these options, refer to Environment configuration. Records created in parameter entities are always be deployed from the Development environment if such entities are not set to be manageable in the Production environment. However, you can choose to populate initial data in the Production environment for records which are manageable there, by copying the same records that are in the Development environment. 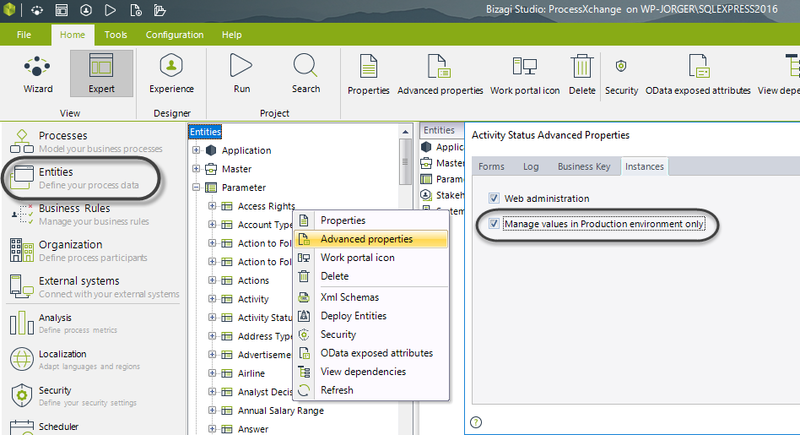 To learn more about defining or reviewing which parameter entities will be managed in production, refer to http://help.bizagi.com/bpm-suite/en/index.html?Where_to_manage_parameter_enti.htm. 2.3. External systems connectivity parameters. 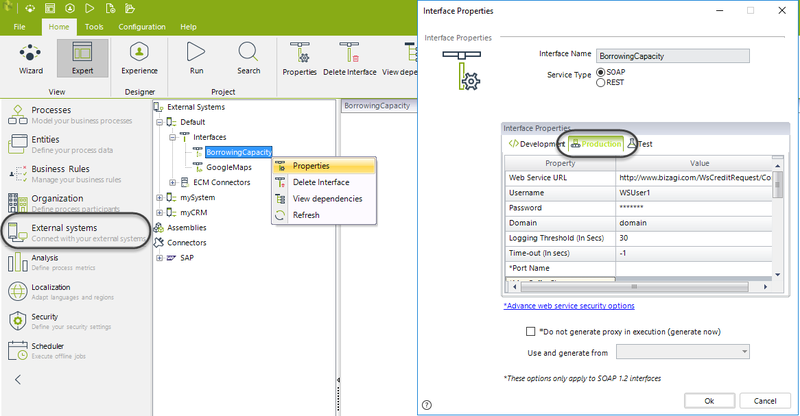 You set these so the first deployment automatically set your target environment with the same values. However, after the first deployment or at any time while that environment is live, you can modify the values in the Management console. To learn how to modify these values, refer to Environment configuration. 2.4. LDAP integration connectivity parameters. 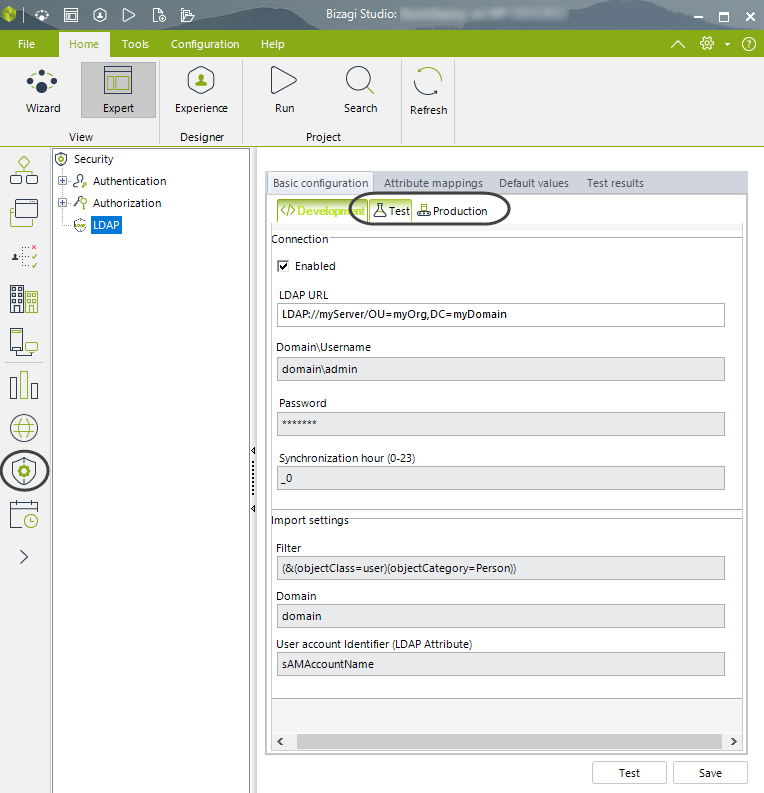 To learn about more on the LDAP import module, refer to LDAP authentication. Your first deployment automatically includes the end users you have created in your Development environment. Review these users to confirm whether they are needed in your target environment (i.e Testing environment) as well. To learn more about managing end users, refer to http://help.bizagi.com/bpm-suite/en/index.html?users_administration.htm. 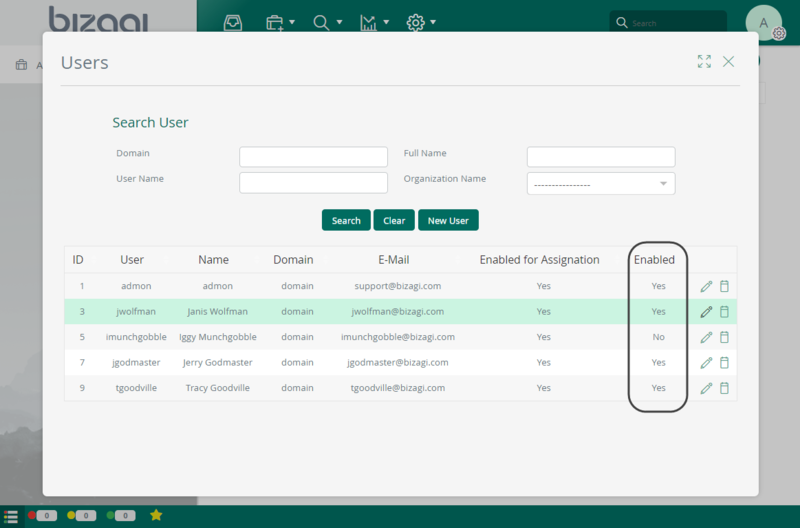 Remember that the domain/admon user is the internal system user employed by Bizagi. Never disable that user account, even though you may choose to limit its access rights so not all menu options are available in the Work portal for this account. Once you know what you will deploy to Automation Service, you can to start a deployment process. For information about the next step, refer to Exporting processes.